GET THE OFFICIAL PRESS RELEASE BELOW and Learn the whole story! Melissa most recently read at her alma mater Fordham University on Nov. 20, 2014. Read about it here. New York, NY (Nov. 24, 2013) - What do you get when you mix academia brightest minds, Street Literature and New York’s most vibrant borough? The incredible story of Khalil and Rasheeda, a young couple from the South Bronx, trying to make it out of the ghetto and have a taste of the prosperity middle class Americans take for granted. Available now via download on Kindle and Nook as well as in paperback on Amazon and Barnes & Nobles, Pure Bronx, is more than just another release in one of literature’s fast-growing genres. It is also the result of an incredible collaboration between Mark Naison, Professor of History and African American Studies at Fordham University and a young graduate student, Melissa Castillo-Garsow (previously at Fordham, and now currently pursuing a PhD at Yale). When teaching a graduate class on street literature and hip hop at Fordham University, Dr. Mark Naison challenged students in the class to help him write a novel which used the non stop action of street literature to bring to life people in South Bronx neighborhoods being changed by an influx of immigrants and big money coming in from Manhattan. Melissa Castillo-Garsow, a master's student in creative writing, took up the challenge and the result is a novel unlike any written before it-- filled with violence, adventure, love, lust, greed and political commentary. “NYU Alumna, Fordham Professor co-write ‘Pure Bronx.’” Washington Square News. Sept. 16, 2013. “Professors Novel Depicts the Realities of Street Life.” The Fordham Ram. Oct. 3, 2013. 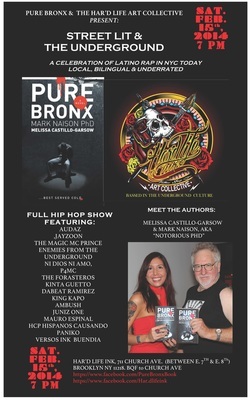 “‘Pure Bronx,’ new urban lit by Mexican American author.” Gina Vergel. Nov. 4, 2013. “Vida Entrevista: Mexican American Author Melissa Castillo-Garsow.” Vida Vibrante. Nov. 3, 2013. “hip-hop Prof pens street lit.” The Bronx Times. Dec. 9, 2013. Lit writing. Just Do It." Fordham Notes. Jan. 28, 2014. Wednesday Dec. 4, 2013, 5:30-7:30 p.m.
Wednesday Dec. 11, 2013, 7 p.m.
January 15, 2013, 7 P.M.
Saturday, Feb. 15, 2014: Har’d Life Ink Reading and Hip Hop Show. Har’d Life Ink Shop, 711 church ave., Brooklyn, New York 11218. Featuring the transnational art collective Har’d Life Art Collective and Mexican Hip Hop in New York pioneers Hispanos Causando Paniko (HCP). Saturday, July 12, 2014: Panelist, “The New Urban Aesthetics: The Black Arts Movement, Revised,” Harlem Book Fair.